Effective Interviewing and Interrogation Techniques believably answers the question, How do you know when someone is lying? 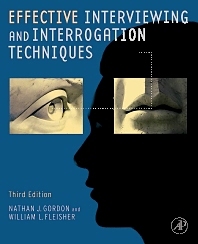 It also provides a guide for interviewing probable suspects and interrogating likely perpetrators on techniques and tradecraft. This book covers topics about searching for truth and revealing lies. It presents forensic assessments based on psychophysiology, and assessments on the basis of non-verbal behavior. The book also covers interview and interrogation preparation, as well as question formulation. It discusses the Morgan Interview Theme Technique or MITT, and the Forensic Assessment Interview or FAINT. The book addresses techniques for interviewing children and the mentally challenged, and offers information about pre-employment interviews. It also explains how to understand aggressive behavior and how to deal with angry people. The book concludes by presenting future methods for searching for the truth. Law enforcement and security professionals, as well as prosecutors, criminal defense lawyers, and civil litigators will find this book invaluable. Forensic practitioners, law enforcement, intelligence community and private security sector, attorneys, coroners, human resource professionals, jurists, psychological professionals, and forensic and criminal justice students. Nathan J. Gordon is Director of the Academy for Scientific Investigative Training, where he developed the Forensic Assessment Interview and Integrated Interrogation Technique. He is an expert forensic psycho-physiologist and an internationally recognized expert in the field of Forensic Assessment Interviewing and Interrogation. He has lectured and conducted seminars on these subjects to thousands of law enforcement, intelligence and private security officers throughout the United States, Africa, Europe, and Asia. Mr. Gordon, a recognized innovator in the field of truth verification, has had his work recognized in publications among which is, Forensic Psychophysiology; Use Of The Polygraph, by James Allen Matte. He has served as President of the Pennsylvania Polygraph Association, numerous committees for the American Polygraph Association, and is a Director of the Vidocq Society. Mr. Gordon lives in Philadelphia, Pennsylvania, with his wife and three children, and grandson. William L. Fleisher is Director of the Academy for Scientific Investigative Training. He was the Assistant Special Agent In Charge of the Philadelphia Office of the U. S. Customs Service. Mr. Fleisher is a former special agent with the Federal Bureau of Investigation, and/officer with the Philadelphia Police Department. He has over 33 years of experience in law enforcement. An internationally recognized expert in Behavioral Symptom Analysis, Mr. Fleisher is the author of the U. S. Customs technical manual on Behavioral Analysis. He is a founder and first Commissioner of the Vidocq Society, an organization of forensic experts who assist law enforcement and victim's families in unsolved homicides and is also a member of the American Polygraph Association. Mr. Fleisher lives in Cherry Hill, New Jersey, with his wife and four children.